For decades, homeowners and interior decorators alike have favored neutral hues such as white, beige, and tan for decorating the kitchen space. This is because the kitchen serves multiple purposes. It needs to be a functional workspace for the person preparing the meals. At the same time, it should also be a warm and cozy area where the family can gather during mealtimes to enjoy their food together. Light and neutral colors work best, therefore, because they are well suited to create the ideal ambiance, both for work as well as leisure time. 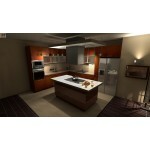 In recent years, sleek and sophisticated gray kitchen cabinets have been gaining great popularity. This rise in popularity of gray cabinets can be attributed to the fact that they offer all the benefits of the light and neutral shades preferred for kitchens, with the added advantage of being fresh, chic, and quite original. So if you want a functional and aesthetically appealing kitchen, without going down the well-trodden path of white or beige cabinetry, then gray kitchen cabinets are the perfect choice for you. Gray cabinetry provides homeowners with the benefit of a chic and modern kitchen space that is relatively easy to maintain. Gray is also a relatively new and refreshing color-scheme for kitchen spaces, which makes it eye-catching and remarkable. Thus, gray kitchen cabinets are easier to maintain than their white or beige counterparts and they can also impress any guests or visitors, who happen to enter your kitchen with their sleek, modern, and edgy design. 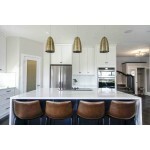 These gray cabinets can also be availed in a wide variety of shades, ranging from cool to warm. Therefore, regardless of your preferences and tastes, you will find a set of gray kitchen cabinets that suit your needs, wants, and aesthetic vision for your dream home. The versatility of the color gray can play a crucial role in helping you create the kitchen of your dreams. Because gray is such a neutral color, you can accentuate and contrast it with any shade of your choice, resulting in a kitchen that is neutral and calming or bright and vibrant – whichever alternative best suits your current needs and tastes. You can change things up whenever you want to by simply adding a coat of paint to your walls or changing the type of countertop you are using. The versatility and neutrality of gray cabinets will ensure that they blend well with any type of kitchen décor you choose to implement, which will provide you with the flexibility you need to experiment. Whether it is a modern kitchen you want or a transitional one, whether you prefer a minimalistic style or a hi-tech and edgy aesthetic, gray kitchen cabinets are perfect for you. These cabinets can give an ideal minimalistic and clutter-free look to your kitchen. On the other hand, when combined with stainless steel appliances and hi-tech kitchen equipment, gray cabinets can also radiate the aura of chic modernity. Gray cabinets also provide an alluring contrast when paired with dark wooden floors, making them equally ideal for traditional or rustic kitchen designs. 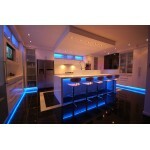 A kitchen can be designed in accordance with a variety of themes, some of which we have already discussed above. Moreover, the color scheme of a kitchen space can also vary significantly, depending on the preferences of the owner. Gray kitchen cabinets are particularly appealing to home décor enthusiasts because the color gray allows for the different components of the kitchen to stand out. So a colorful backsplash or a white marble countertop will be doubly gorgeous when paired with a set of gray cabinets. Even something as simple as some colorful cabinet accessories like a red ladle or a yellow bowl can make your kitchen space look vibrant and lively. Or you can also opt for a white and gray color scheme if designing a peaceful, uncluttered, tranquil, and pristine kitchen is your goal. Another thing to keep in mind is that all the cabinets in your kitchen space do not necessarily need to be of the same color. So you can pair gray cabinetry with black ones for a more edgy, dramatic, and bold look. You can also blend different shades of gray together to achieve a layered and complex color scheme. Moreover, gray cabinets are easier to maintain than white ones, because they can better disguise minor scratches, dents, and stains that would be painfully noticeable on a white surface. 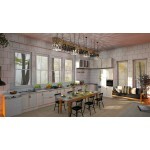 Before purchasing a set of gray kitchen cabinets, however, you must determine the type of cabinetry that you want. You can opt for gray cabinets that are stained, painted, or gray-washed. You can also choose between light or dark gray cabinets. You might want to check out the catalog of a reputed manufacturer of cabinetry, to help you decide on the type of gray kitchen cabinets that best suit your tastes.